The Monster: Blade of Darkness is not the only novel to be published under the title “The Monster”. The whole story about Jessie, Jack, Azul and, of course, Blade of Darkness is planned to be released as a trilogy. The main reason for this is that the ideas and point of view presented in the story are too strong and bold to be understood and thus be presented at once. Therefore, I decided to lead you, dear Reader, to them slowly but steadily in a logical way, starting from something more or less common in literature nowadays and ending with that strong and bold conclusion I have in mind. Each novel in the trilogy has some hints that reveal a bit the plot and key messages in the following novel and “le Grande Finale”, so you just have to read each novel carefully and perhaps re-read it again in order to see how the pieces of the puzzle form the Big Picture. “The Monster” trilogy consists of the following novels: “Blade of Darkness”, “Armageddon’s Blade” and “Battle for the Earth”. This is the first part of the trilogy that represents the inception of the whole story and the introduction to the key message behind it. The novel introduces the protagonists, Jessie, Jack, Azul and Blade of Darkness; takes you, dear Reader, to the most important location of the whole trilogy – S*** Island; and initiates the chain of world-changing events that will lead to the last novel of the trilogy. I started working on the novel “The Monster: Blade of Darkness” back in 2000, when the idea of the trilogy had appeared in my mind. In 2010 the first draft of the literary work was completed. 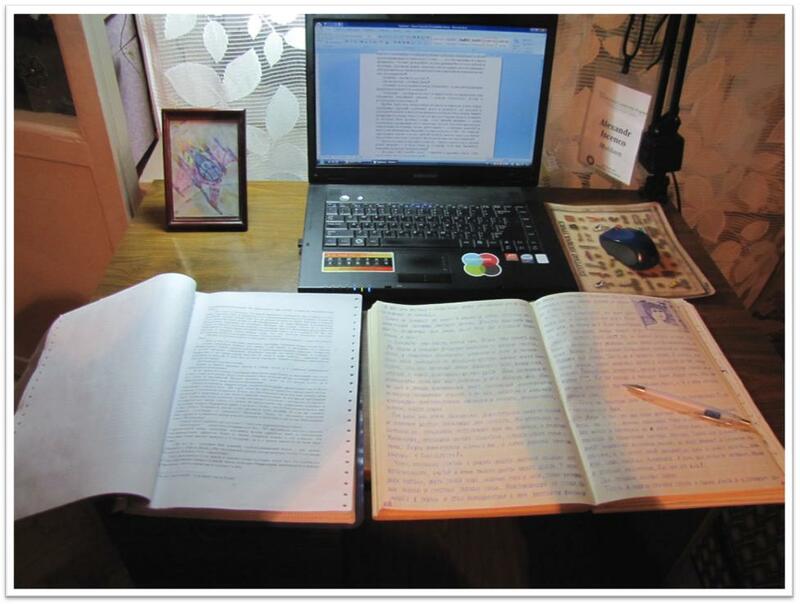 And in 2013 the revision and editing of the text of the novel were finished. All the work took so much time, because while writing the novel, I had also been engaged in studies, work and active volunteering, which is described in the Author section of the website. Due to the great support from the community of amazing people, “The Monster: Blade of Darkness” was published in 2014. The list of all the supporters, contributors and fans of the novel can be found on the Supporters page. The second part of the trilogy reveals the events happening several years after the story of “Blade of Darkness”. You, dear Reader, will finally find out what is the meaning of all the hieroglyphs and petroglyphs in the Blade of Darkness’s cave, as well as uncover the whole secret of S*** Island. At the same time you will see what “gift” Blade of Darkness has prepared for the world. The work on “The Monster: Armageddon’s Blade” is planned to start in May, 2015. I intend to publish the novel by 2025. The third and final part of “The Monster” trilogy summarizes the events in the previous novels and connects them in one logical chain that leads to the key message of the whole trilogy. Here you, dear Reader, will undestand why everything happened exactly as it did. And you will also learn what could happen to our planet if we follow the business-as-usual scenario and what can we do now to change that in the future. Furthermore, “Battle for the Earth” serves as a connection point between my earlier novels (“The Scorpion”, “The Black Hole” and “Road to Happiness”) and the upcoming ones. The work on “The Monster: Battle for the Earth” is expected to start at the beginning of 2027 and finish by 2037. Please stay tuned for updates on the progress with the trilogy from my side.